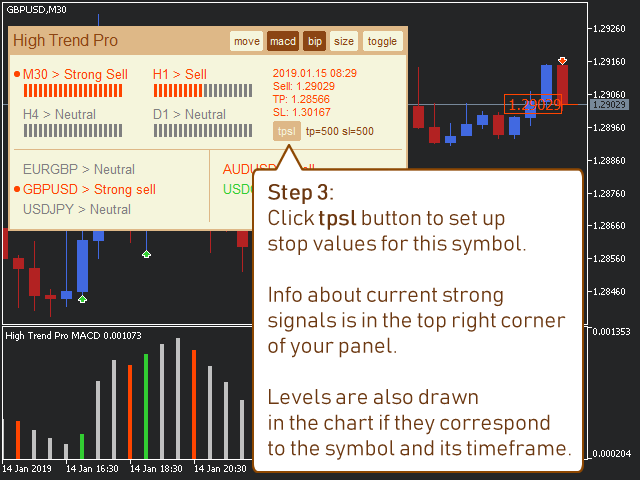 The indicator High Trend Pro monitors a big number of symbols in up to 4 timeframes simultaneously and calculates the strength of their signals. The indicator notifies you when a signal is the same in different timeframes. The indicator can do this from just one chart. 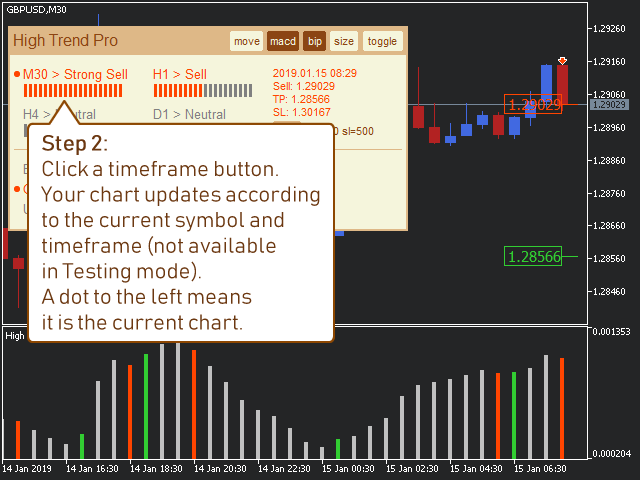 Therefore, High Trend Pro is a multicurrency and multitimeframe indicator. High Trend Pro uses emproved versions of popular and highly demanded indicators for calculating its signals. High Trend Pro calculates the signal strength for all selected symbols. Click the symbol button in the indicator interface to quickly access its signal strength in all selected timeframes (up to 4 timeframes). The first start of the indicator with more than 10 symbols may require several seconds to load all data. From then on, the indicator works correctly with all symbols in one chart. The indicator can notify about a strong signal with a sound bip, a push-notification or an email. You will need to set up push and email notifications in the menu of MetaTrader. Color preset - you can choose from four. Email - number of minutes after which email notifications about strong signals are sent. Set zero to switch off. Set up email settings via the menu "Tools > Options > Email". Push - number of minutes after which push notifications about strong signals to your smartphone are sent. Set up push settings via the menu "Tools > Options > Notifications". Symbols source - there are 2 options: Market_Watch or Custom_List. For the Market_Watch, the indicator monitors and looks for signals for all the symbols currently started in the Market Watch window. For the Custom_List, it is for all symbols listed in the property Symbols custom list. 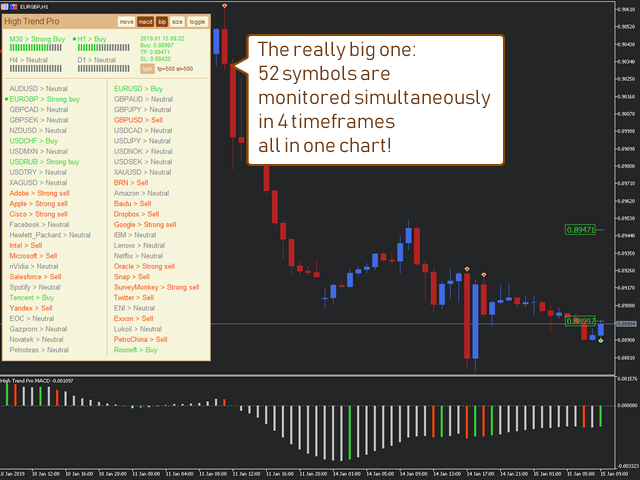 Symbols custom list - it is a comma-separated list of your symbols which the indicator monitors and for which it looks for signals. You need to choose Custom_List for the property Symbols source. Global stoploss - minimal distance from the current price, after which the High Trend Pro tries to find a stoploss level by the nearest bar extrema in the current chart. Use pips. Global takeprofit - minimal distance from the current price, after which the High Trend Pro tries to find a takeprofit level by the nearest bar extrema in the current chart. Use pips. Господа, рекомендую читать инструкцию перед покупкой. Все работает, главное не торопиться. 1. I made a sequential load of symbols. So now you don't have to wait till it all loads completely. 2. I added support of fonts for both Mac and Windows PC. 1. 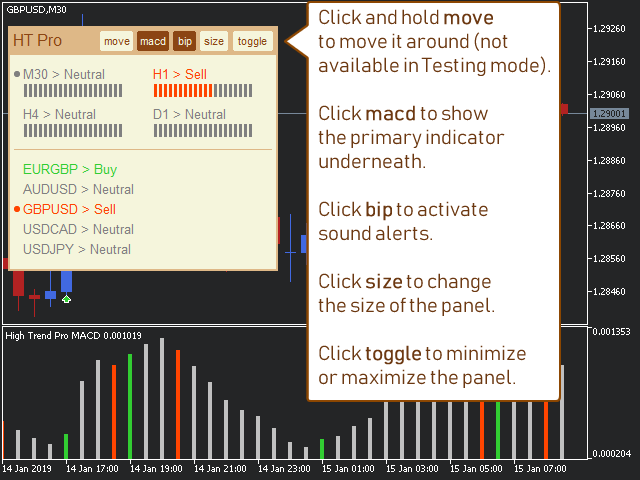 I changed a function that shows / hides the MACD indicator, so now it is available in Testing Mode as well. 1. I increased calculation speed. 2. I added a new error check. It prints itself in the Experts tab. If the error occurs, it is necessary to restart the indicator. 1. MACD indicator can be shown and hidden with a new button. 3. History of previous entries is shown when the selected symbol and timeframe correspond to the current chart. 4. A new short bip sound not to be confused with the standard sounds of MetaTrader. 1. 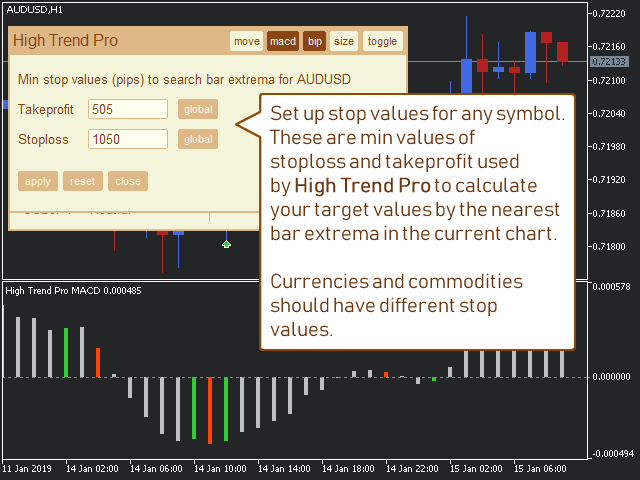 You can now set target values of stoploss and takeprofit for any symbol via the High Trend interface. Commodities and currencies should have different stop values. 2. A new button bip in the interface to quickly control the sound alert. 3. New color scheme added. 1. High Trend has learnt to draw levels of a strong signal in the current chart. 2. It now loads symbols a smart way. 3. Strongs signals are in the top right corner of the enlarged panel.